Yes, we cut down our tree, and don't get into it about the green issue with me. Cutting your own is greener than a fake tree for numerous reasons which I wont get into here. So, no nasty comments here please. kthanks. to me, what's the diff if YOU cut it or someone else does? know what i mean? either way it's christmas fuckers!!! merry season!! we get ours on sunday! i think i want a potted tree this year so i can fancy it all up martha stewart like in a big basket. this way my cats don't drink the water either and go puking all around the house. AND i can plant it later! win win!!! chop away linds. can't wait to see it all done up LEB style. Plus...fake trees don't smell yummy! Katie, very true! The smell is awesome! ooh much fun! Have a great time! (we went with the fake tree for ease and for dogs before I realized how bad the fake ones are!). Miss the real deal!! can't wait to see it- your place was so beautiful last year i know it's going to be even better this year with all of your new changes!!! Well good for you! One year we bought a live tree and then planted it afterwards. The plan was to have one in our yard from each year, but then we moved. It was a complete pain, but was certainly green. Have a great time! Have a great time.The girls want us to wait until they are home. Your house will smell so wonderful. Makes me think of Christmas Vacation- one of my favorite movies ever!!!! Good luck! I'm so on team LEB with this one!! nothing can replace that smell. I've been such a bad bad bad naughty blogger lately. But I LOVE that you're getting your tree. We're getting ours on Wed, not cutting it down, Houston is lame like that. Best.time.of.the.year.EVER!!!! YES! We have the same tradition in my home. There is almost nothing better than the pine scent filling your home. Have fun! We always get a fresh cut tree for Christmas and this year I am focing my parents to wait for me to get home from school until we can go as a family to go and pick out the Christmas tree! So excited! me tooooooo! I'm going to have a blogger Christmas party...or, better idea...you have one! Great tradition..we do that too! It's so fun, isn't it? The trees all look so small at the farm and then end up huge when we get it home. loves it! You know, I love real trees! Frasier firs are my favorite, followed by Noble firs.... I prefer fir trees to pine trees. 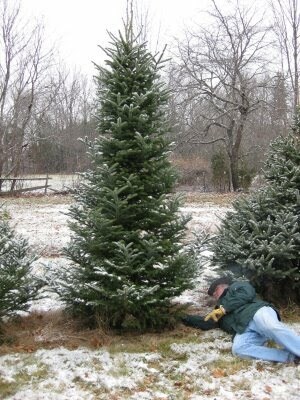 I didn't go and cut mine down, but when I was single I'd go and buy one on the Sunday after Thanksgiving and spend the day decorating it. Loved it!! Of course, then I met Chris, who has "allergies" to the real trees (supposedly). He went out and bought me a tree of the fake and pre-lit kind as a "surprise" one year. Surprise! So, yes, I decorate a fake tree. At least for now.... fake tree may end up sustaining some damage down the road. You never know! But I can't not use it while it's still kind of new. I will admit, though, having it pre-lit IS pretty awesome, though. growing up in Tahoe, we cut down our own tree. Usually with a permit, but sometimes in the backyard! Can't wait to see yours all dolled up. What a wonderful tradition and I completely agree with you :) I can't comprehend how someone would want a fake tree! timber! I love the holidays too. The Rock Center tree will be lit tonight! can't wait to see the tree you picked out!!! yay for christmas!